The three star Longfields Hotel is known for its attention to detail and impeccable service. A very popular hotel with both locals and visitors alike. It is located in Fitzwilliam Square which is an ideal base for exploring all that our fair city has to offer. Dublin’s fashionable shopping streets, theatres, cinemas and tourist attractions are within walking distance. The hotel offers 26 individually decorated en suite bedrooms. Fabrics, colours and fittings were all carefully chosen to ensure calm tranquility and peaceful sleep. The rooms are fitted with all necessary facilities including remote control multi channel televisions, direct dial phones, and modem points, room service and an elevator. There is also a babysitting service and a price reduction for children. Longchamp at Number Ten serve breakfast, lunch and dinner in both the main dining room and the elegant private room. The beautiful lunch menu and the scrumptious Dinner A La Carte menu offer mouth watering delights to stimulate the taste buds. The wide variety of dishes is carefully prepared using the finest of fresh ingredients. Think of delights like Honey Glazed Fillet of Cod Served with Dressed Rocket and Crispy Courgette with seasonable vegetables and potatoes followed by Summer Berry Crème Bruleee all washed down with a bottle of fine wine. Yummy. The hotel is situated on Fitzwilliam Square in the heart of Georgian Dublin. The famous shopping streets of Henry Street and Grafton street are just a short ramble away. 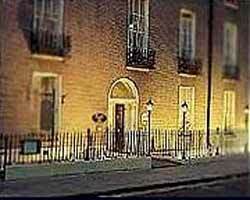 Or take a saunter to Temple Bar with its quaint bohemian atmosphere and buzzing night life. For a historical look at Dublin take a wander to Dublin Castle, The Natural History Museum, The National gallery and Dail Eireann.